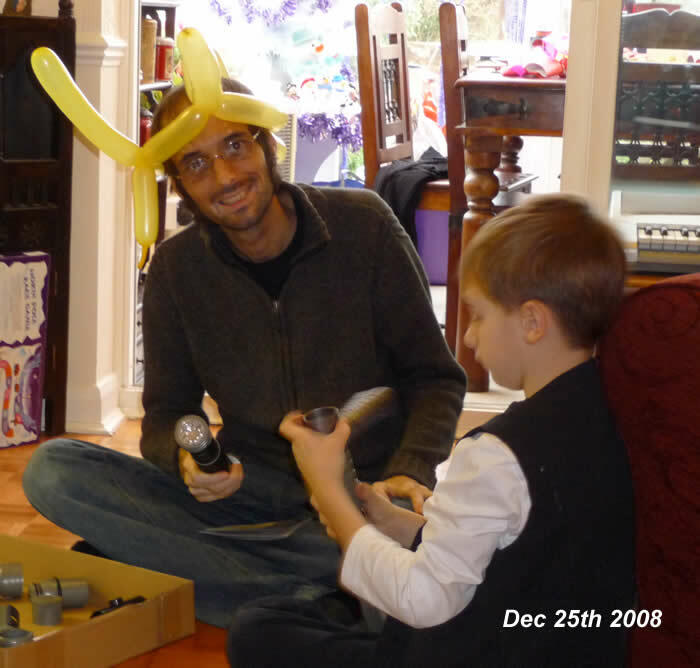 The photo above shows Ryan playing with his nephew Rhys on Christmas Day. They adored each other. 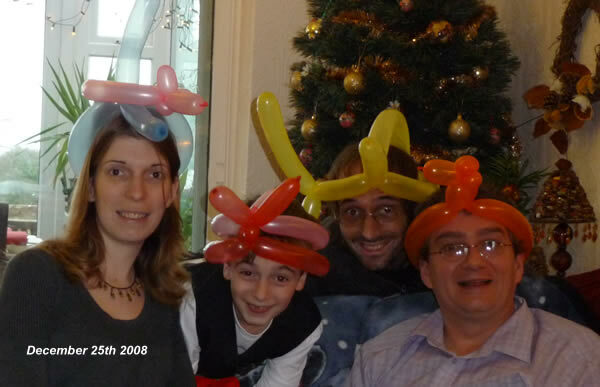 The photo below shows Ryan with his family on Christmas Day, sister Ami, nephew Rhys and step-Dad Dave. 26th March 2009: Hi to you all who left messages of condolences on Ryan's web page. Thank you for all your kind words, they have been a great comfort to us. We have waited eight long weeks for the results of the toxicology tests following Ryan's sudden death in Glasgow in January. At last, we have finally heard from the coroner that Ryan had a very rare disease called Addison's disease. The flight from Brussels to Glasgow was too much for his body to cope with and he died of an Addisonian crisis at the hotel. Sadly, he had never been diagnosed and it could have been treated. The symptoms are: vitiligo, poor appetite, browning of the skin, weight loss, low thyroid function, craving for salty foods, irritability and fatigue. It is not usually diagnosed until a crisis occurs and the patient is taken to hospital. Ryan had all the symptoms but we just didn't link them together, we had never heard of this before and we didn't know he was dying. It's very sad. It is a very rare disease and the coroner has suggested that Jeanette, Ami and Rhys are now tested for it because it is hereditary. More information about it is available on google. Apparently only 1 in 100,000 people have it and most doctors never see a case. He was truly unique! In every way! Thank you all once again, we miss him terribly, but at last now we have some answers and a little peace in our hearts. 9th February 2009: Ryan's funeral will take place on Thursday 19th February 2009. The service will commence at 2pm at St. Mildred's Church, Whippingham, Isle of Wight and the service will be conducted by Reverend Jonathan Hall. After the service Ryan will be buried at Fernhill Woodland Burial Site. Reverend Hall has forewarned us that St. Mildred's can be extremely cold this time of the year so please expect Arctic conditions and wear cold weather gear. The wake will be in the church centre next to St. Mildred's. 7th February 2009: Dave, Jeanette, Ami and Rhys would like to give their sincere thanks to everyone who have entered messages here, sent emails and cards. Although we do not personally know all of you, we feel a tremendous amount of support from you all his friends, colleagues and relations at this sad time. All your kind words and memories of Ryan are helping us all come to terms with losing him. Ryan is being brought back to the Island early next week and we will let you have more details about the funeral then. It will be during the week starting 16th February. 4rd February 2009: Today we met with the funeral director (Geoff Leather) and started making arrangements for Ryan to be brought back to the Island. As yet the coroner has not released Ryan but the undertaker expects this to be Monday at the earliest. As soon as we know the date that Ryan will be back we will post it here. We cannot set a date but we have decided to have the service at Whippingham Church and the burial at either East Cowes, Mount Joy or Wootton woodland burial. The service and burial will be open to anyone but to get an idea of numbers coming please try to let us know. Dress code = none, we don't mind what people wear. Sorry still no dates but it is out of our hands. I still ask if anybody knew Ryan was ill then please let us know because you might be able to help the police and ourselves ascertain the cause. 3rd February 2009: Sadly, Ryan passed away in Glasgow on Tuesday night 27th January 2009 while visiting a friend. He was alone in a hotel room when he died and we are all devastated by his sudden death and by the fact that we were not able to be with him. We are currently arranging to bring Ryan back to the Isle of Wight. We will post the funeral arrangements here. He will be buried on the Isle of Wight. We do not know how he died until the results of the post-mortem in 8 weeks time. We are all in deep shock and disbelief. Ryan was a talented and brilliant son, brother, uncle, nephew, cousin and grandson. A gifted writer and linguist, living in Brussels, where he worked as a translator for Europolitics. Thank you for posting the results of the tests. Take care, hoping and praying the rest of your family stay healthy. Rest in peace Ryan, I miss you much! My thoughts and prayers are with you all today. I'm sorry I can't be there. I hardly saw Ryan once he had left for university but to read all these tributes gives a picture of a truly good, respected and well-loved man, a son, brother and uncle you can all be so proud of. I hope that time brings the explanations and comfort you need so much. I only worked for a short time with Ryan during our time with Laga, but I will miss him. He was such a nice and funny guy, full of support to all who needed help. I was shocked and in great disbelief when I heard of Ryans death. I cannot stress enough how nice of a person he was, he would go to great lengths to try and help with any problems I may have had and would always know how to put a smile on my face. I feel priviliged to have known such a wonderful person. My mind has been preoccupied with Ryan ever since I heard the news of his sudden death. Only four months I have been working with Ryan but I could already tell he was a very special, funny and helpful person. I will never forget him. Please accept my sympathies. I am shocked and very saddened to hear this tragic news. I remember Ryan from school. He was such a fun, lively and lively person, and I have many fond memories of him at Carisbrooke High School. He will be sadly missed and my thoughts and best wishes go to all his family and friends. From Ryan's former colleagues at Laga law firm, Brussels. We would like to extend our and deepest sympathy to Ryan's family and friends for their loss. Ryan was much appreciated during his stay at our firm where he showed dedication and brilliant writing skills. We also enjoyed Ryan's vitality and personal drive albeit his plans to write a novel or learn new languages. Achieving these goals would have definitely led him to happiness. Everyone at Laga is saddened by his passing and we keep fond memories of his time with us. I hope you don`t mind me contacting you both. I read about Ryan in the County Press, I couldn`t believe it. Another young and well loved person taken from us. Our son, Michael died last April at Brighstone while riding his motorbike. I just wanted you to know I know exactly what you are feeling and going through. If you ever want to meet for a chat please don`t hesitate to contact me. Best wishes. Jean. Dear Jeanette, words can't always express the feelings of the heart. Behind all the emotions, all the questions, all the anger, all the tears, there is a gentle heart that shines, that wants to be content, that wants to be away from pain. It is the love that looked after him all his life, and that continues to look after us all. When sadness and tears fade, the heart will still be there, remembering the good times, the love, remembering the best and letting go of the worst. I know your heart will shine again and time will heal. I have read all these messages and the picture of a wonderful man comes through them: a sharp mind and an inspiring friend. I am thinking of you and your kindness and you are in my prayers. We all can't believe what has happen. Our thoughts are with you all, He's still in good hand . Wish you all our love and condolences. Ryan, you were so funny, it's odd because, most of our correspondence over the past few years, since you left the 'wilds of Norfolk' as you put it, have been over the internet, and now I'm writing here, now, in these circumstances. I very much enjoyed our conversations when I was in my first year, I would look forward to coming on msn and having you cheer up my afternoon when I would otherwise be feeling sorry for myself. This is what I will remember you for, and this is what I will cherish if I ever begin to feel sorry for myself again. Did you ever finish the novel that was going to make you into that literary icon, or was all that comedy 'stuff' you were downloading from limewire too distracting? Big Love Ryan, you will be missed. My thoughts, condolences and love are with Ryan's family and friends who were fortunate enough to know him so well. Ryan, I can't believe that you are gone. I have such great memories of hanging out with you, Mischa and Holly at Gladstone St and watching Family Guy and your manga stuff. You made me laugh so much and were such a good judge of people: unsparing, fair and usually hilarious. Once I stayed in your room when you weren't there and I read all your comics - they were great, thanks. I'll miss you, buddy. I still in shock over this very sad news and would like to send my most heart felt condolences to Ryan's family and friends. I had not spoken to Ryan for a little while unfortunately. He was a great friend at University, always making me laugh so much with his sharp wit and observations. I will always remember his love of films and literature and his ability to write! He will be sadly missed, rest in peace mate. We are in deep shock as is everyone at the news of Ryan's passing away. Our thoughts are with Jeanette, Dave, Ami & Rhys at this sad time. Ryan, why is it that the good always die young? You had so many friends and fitted such a lot in such a short space of time. You will be missed by so many and will never be forgotten. May you rest in peace. I've alwasy thought of the snow as all the people we have lost falling from the sky above. After Ryan passed away the snow fell from the skies. I hope every time you see the snow you will think of Ryan and how soft, gentle and bright he was. I know he loved his nephew Rhys very much and hope Rhys will remember his visits to the cinema with him and more. My heartfelt condolences go to all of the family. Love and hugs to Jeanette, Ami and little Rhys. We were so sorry and sad to hear about Ryan,and still can not believe it.Ryan was always a sweet little boy,and grew into a lovely man.We saw him up mums[his nans often ]he always came to see her when back on the island, bringing her cheeses and pates which she loved ,he was always thoughtful .Nan and Grandad loved him to bits[as they did all there grandchildren.Ryan was always full of chat about his mum,stepdad Dave,Ami and Rhys,his family were very important to him.I know nan and Grandad will be looking after him and am sure nan will be cooking him something tasty. Ryan, It's quite strange now when that i log on to facebook i'm not met with 'BETHBETH!' in counter to my 'RYRY!' in order to get the first word in. I will miss winding you up about your hand bag and all the other things and i will miss having you jibe me about plenty too! I've dug out that signed Athlete CD you got me and will keep it safe because it makes me think of you, i'm very sad that we didn't get the chance speak much before you left, i hope you're happy where you are. My deepest sympathies to all of your family. Jeanette, I was so very sorry to hear about the sudden death of your son. I cannot begin to imagine how you or your family must feel. You have been, and will continue to be, in my thoughts and prayers. I cannot believe all this... I am greatly saddened by those news. I met Ryan at Carrisbrooke HS on the Isle of Wight. I was his French language assistant in 1999-2000. And what a student he was! So witty and bright, he could speak French very well already and I sensed a potential in him. I took it upon myself to make him go to France for a year and study French in my hometown of Bordeaux. He setlled very quickly and did very well. His passion for art in general and his exceptional sense of humour amazed me for a boy so young. It was 9 years ago but I kept 2 of his hilarious e-mails that I still read from time to time. a very good game.You will no longer be allowed to play it, and should instead play proper football. So British... Tu nous manqueras. My deepest sympathy and prayers go out to Ryan's family and friends - this is such a shock to everyone and a really difficult time. He was such a fun, lively and energetic person, and I have many fond memories of him at Carisbrooke :-) - mostly involving plasticine!! if I find some pictures I will post them on here somehow! Not sure if I will be able to make the funeral, but if I can't I will be thinking of you all. It was a great shock to hear of your sad news. I am so sorry to hear you have lost your son so unexpectedly. My thoughts are with you, and with Dave and all your family. Ryan was a good person. I'm still in shock and I don't know what to do, what to say. I am shocked and very saddened to hear this tragic news. I remember Ryan fondly from school and we worked together for a number or years at Safeway in Newport where is laugh, comedic antics, and also great intelligence made work utterly enjoyable. He will be sadly missed and my thoughts and best wishes go to the family. I was really sorry to hear your sad news. Can't say anything to help you but thinking of you. Ryan, I didn't know you as well as I should have and I will always regret not making time to finish the last conversation we were having. It just seems like such a terrible waste that you will never get to do all of the things you had planned. I always appreciated the help, advice and sobering sarcasm you gave me. Condolences to all friends and family. In 2003 Ryan and I spent most weekends together in the Concrete office at UEA making a magazine. It was a weird time, the office split down the middle. Half of us wanted to make an intelligent magazine, the other half wanted a cheap tabloid. Ryan and I would escape everyonce and while and sit on the balcony above the Hive and joke around and make withering comments about film and tv. He was a genuine wit and talent. One of, if not the, best writers on the paper, one of those guys you just click with instantly. I'm still kind of in shock about this, as I'm sure everyone else is. It's so unfair. My heartfelt love to Dave, Jeanette, Ami and Rhys. My love to you too Ryan - I'll miss you mate. Ryan, I miss YOU, your laughter, your crazy jokes,,your great sense of humour. Your memory will never fade Ryan. You will always be in my heart. We will always have 'spinick'. I am sad when i think of you, that i will never be able to share moments with you. Hey, that's me a 'petasse'.your words Ryan...Thank you for being a great friend. May you rest in peace. Ryan, I can't believe you will not come back. I look at your chair and your desk and I think 'no, this is not possible'. I would like to thank you for all those moments when we spoke about Japan and the Japanese, literature, movies, and all those moments we spent laughing in the kitchen, waiting for the water to boil. I hope that where you are now, you can practice your Japanese and nibble on those terrible British sweets which you made me discover. I miss you. As you well knew I am an awful writer but I am trying very hard to make this message make sense or you would be correcting me. I am so proud of you, I think you know this from our long chats last summer and Christmas. In the last few years you have grown up and I felt at ease with you making your own way in life. I know it made your Mum so sad that you had your independence and spent so long away but I know that to stop you would have been wrong. You have done things and been places that many will never do in a lifetime and to have your life cut short rips me to bits. I know you are now with your Nan and Granddad and say Hi to my Dad Joe (he also was proud of you) and of course lots of cuddles for the nuttiest bunch of cats ever - Roger, Bob, TJ and Tom. I enjoyed us ganging up on your Mum about the telly. How will I ever argue with your Mum again without you here? Star Trek and Buffy are the things to watch and not soaps. As for Duke Nukem and Bloodâ€¦ we were 2 men obsessed and probably wasted 6 months completing these but it was fun! Still not played the games you got me since Christmas, I am an old fart and as you saw at Christmas I need you in multi-play mode as I am useless. I will try though and see if I can get to the next level where we got stuck over Christmas. We had so many great times together as a family and I am so glad that you had a happy life. Every day you and Dad will be in my thoughts until I join you. To all the family and friends of Ryan I extend my deepest sympathy. I had the privilege of teaching Ryan at Carisbrooke High and have many happy memories of him in class. It was a huge shock to hear the news of his death and I wish I could attend his final goodbye but distance precludes this. His sense of fun, wonderfully crazy attitude linked to such intelligence made him unforgetable. His, handmade small blue worms, snails and other tiny critters, which appeared with regularity on my desk, still bring a smile. He will be deeply missed by many, this is so sad, he was a lovely person. Witty, funny, smiling, spontaneous. Ryan generated a consensus around him and an immediate fellow feeling. It's so unfair. Please accept my deepest sympathy and support. Also, thank you for partly opening your family album. It brings us closer to you, and to Ryan. Ryan I miss you. Ryan, i remember us running around the tree at the top of nan and granddads road playing 'it',play fighting on their bed and generally having a great time being children, without a care in the world. I last saw you when i was digging out my bosses back garden i was covered in mud, soaking wet and pushing a wheelbarrow full of broken cement blocks. I heard someone laughing, looked up and there you were smiling and ready to take the mikey!! All my thoughts with ami and her family. This is a terrible news. Ryan had a unique personality and was a great colleague and translator. His dream was to go to Japan and I had given him an appointment in Tokyo next year as a joke... His sudden departure give me even more reason to enjoy as much as possible my stay in the Far East. I loved Ryan as my best friend for about 4 years. He was an extraordinary person who knew how to listen and how to be there for the ones he loved and cared for. We used to talk every day and night. Even with the distance...him in Brussels and me in the USA, we always managed to find time to be there for eachother. We had ONE phone conversation while I was in Belgium in 2006. We wanted to meet eachother, but it never happened. I regret not seeing him, as he was a very special person to me. In the little time that we really got to know eachother, I knew one thing from the get go...Ryan was a true person, so upfront and honest. I had so much respect for him. I remember when I wanted to move to Belgium that he offered me his old job at a law firm. He spoke very highly of me and I actually got the offer for the job thanks to him. He and I really looked out for eachother and I am so sorry I couldn't tell him in his last moments of his life just how much I appreciated all he has done for me. There is nothing I wouldn't do to bring him back. I am selfish and do not want him to be anywhere else but here. Unfortunately, reality has struck and I know in this life, I won't see him or speak to him ever again. My heart goes out to his family. I am a mother of a beautiful little boy and I can only imagine what Ryan's mom is going through at this time. I couldn't bare the loss of a son and I want to tell Ryan's mom that you are a very strong woman. I read what you wrote and my deepest sympathies go out to you, and the whole family as well. Ryan was also my colleague. I had often some words, short or longer conversations, always funny. Ryan had always a funny word to say, a smile on his face, a good story to tell. Several time in the day, while he was translating our articles, he also had these good words... about our articles... about everything. It could last few seconds, but enough to make the team smiling. I miss him, we all do. I want to remember him smiling, telling a joke. This is so sad, so tragic. Ryan was my colleague. I can't say that I knew him very well. But I can say he was such a nice, sweet, smiling, listening guy. We are all shocked here. All looking every day to this empty chair, his desk full of superheros. Nobody can moved them. Super Ryan... this is so sad. Mu deepest deepest sympathies go to his family and friends. I remember you, Ryan, coming to your first film writers' meeting at Concrete and volunteering for the most boring assignment on the slate just so you could do something. And you did it wonderfully. From that point, whether we were laying up articles on Japanese horror (years before the rest of the world discovered it...) or desperately trying to download movies we couldn't get into press screenings for, editing that film section with you was a great year in my UEA life. You were always ready with drinks and toast whenever I rolled back into town after some travel or another, and on the end of e-mail with some wacky opinion on a movie or 80s children's toy when I finally moved halfway around the world. God bless. We were so shocked and saddened to hear your sad news. We remember Ryan when he was at school with Dane and Chad and how they used to share their enthusiasm for 'Guns & Roses' amongst other things. Ryan and all the family are in our thoughts and prayers. Our colleague, Ryan John Stephens, passed away on 27 January 2009 in Glasgow. He was 28. Ryan worked as a translator for Europolitics for over two years. The memory of his talent, competence, intellect and devotion beyond the call of duty will forever remain with us. Rest in peace, Ryan. Toute l'Ã©quipe d'Europolitique est profondÃ©ment attristÃ©e par la disparition brutale, Ã 28 ans, de Ryan John Stephens, dÃ©cÃ©dÃ© le 27 janvier dernier Ã Glasgow. Depuis 2007, Ryan avait su, par ses qualitÃ©s professionnelles et humaines, dÃ©passer le rÃ´le effacÃ© mais fondamental qu'occupe un traducteur dans la production d'un quotidien comme le nÃ´tre. Ses collÃ¨gues ont perdu un ami. Ils expriment leurs sincÃ¨res condolÃ©ances Ã sa famille Ã laquelle des mots de rÃ©confort peuvent Ãªtre adressÃ©s en Ã©crivant Ã cette adresse. Ryan, it had been a while since we last hung out, but I'll always remember those days sitting around in the Concrete office in the last year of uni. But even more nipping out for ciggies and people watching on the balcony when we should have been putting together the paper, talking nonsense and you listening to my myraid university grumblings. I was one of Ryan's student while teaching in Belgium. We used to argue a lot about a bit of everything but we also used to laugh as much as we argued. I still can't believe it, I'm really in shock. I really learned a lot with Ryan, I really improved my English. I kept in touch with him while leaving school. Ryan, I knew you whilst at University and working for Concrete together and I learnt a lot from you, most of it weird and very wonderful. You were the kind of person that inspired those around you â€“ to pierce body parts, embark upon random topics of conversation, to speak openly and honestly. I remember some parts vividly â€“ like reviving you after a particularly difficult piercing that ended in you fainting outside Styx or drunken nights when you let me talk nonsense at you, because you were like that â€“ a great listener and a loyal, sweet friend. You will be so missed by so many people. My heart goes out to those that knew you and loved you. You were funny, creative, thoughtful and strong-willed and you will never be forgotten. My name is Dominique and I'm an English teacher in the first college Ryan worked for when he arrived in Belgium. I was there at the reception organized by our Ministry of Education to welcome him and the other new language assistants from abroad. Then, we worked together for a whole year meeting twice a week at the ISES, Haute-Ecole Paul-Henri Spaak in Brussels. Ryan was loved by all his students, probably because he was pretty much the same age and shared the same interests but also because he could listen to everyone and then express a witty thought with a big smile. He would also organize debates and discussions on subjects that would leave nobody indifferent. He was really dedicated to his job. The sad news was passed on to me by an ex-student who had kept in touch with him and me. I'm really in shock and wish to express all my sympathy to his family. Dear family members, please accept my deepest sympathies. I am deeply shocked and feel empty about this tragic loss to both the friends and family of Ryan. I have many fond memories of the time we all spent at school and the antics both inspired and carried out by Ryan. I have passed on the sad news to my mum who had the privilege of teaching Ryan. I know he will be greatly missed and I hope where ever you may be now mate, your making those around you smile and laugh with little Blu-tack snails. RIP mate. I really don't know what to say. It's been such a long time since we last saw each other in Norwich but we did speak on facebook a fair few times before Christmas. My heartfelt condolences go out to Ryan's family for such a tragic loss. Ryan was a wonderful colleague who will be sorely missed. My thoughts and prayers are with you all. Surpris et touchÃ© par cet Ã©vÃ©nement tragique, nous avons gardÃ© le souvenir d'une personnalitÃ© forte et originale dont le passage fut remarquÃ© lors de son passage dans notre Ã©cole, le dÃ©partement Ã©conomique de la Haute Ã©cole Paul-Henri Spaak Ã Bruxelles. I grew up with Ryan, he was my best friend for many years. I have so many memories of Ryan that I will treasure, I owe him a lot and I'll never forget. To Jeanette, Dave, Ami and Ryhs, thank you for giving us a place to express our sadness, you'll be in my thoughts for a long time to come, I'm so sorry. You were the most precious baby son to me, so sweet and placid. I wanted you near to me for all my life. I never wanted to let you go. Sadly now, I think back to the steps in your life that gradually gave you your independence. On your first day at school I felt nervous for you. But you were just fine. The day you started High School I worried about you. And you missed the bus! But you excelled. The day you left the Island for University I was distraught. But you shone brightly and became a brilliant writer and linguist. The day you left this country to work in Brussels I was anxious. But you were talented and had a bright future. I had to let you go. The day you died. And you are not here. I am inconsolable. No more brilliance, no more brightness. 'Out, out, brief candle.' I never want to let you go. My precious, precious boy I had no time at the end to tell you how much I loved you and how proud I am of everything you achieved. I am heartbroken and I just can't bear to let you go. Memories of you will stay with me forever. Sleep peacefully with Nan and Granddad, from Mummy. I have so many amazing memories of you, Ryan - from first meeting you in the Concrete office all those years ago at UEA, then you coming to our house party on Grosvenor Road later that day (I think it was that day). Then there was the year we spent living together in that tiny house on Gladstone Street with Henry. None of us were ever employed at the same time and our days were filled with noodles and frozen food, endless Friends reruns, watching Neighbours twice a day, FLCL, loads of your weird manga stuff, selling Backlash outside gigs, trips to China World (which must have been your favourite place ever), late night chats and cups of hippy tea, you staying up forever translating whole books at random. I had so much fun in that house, and it was so great that you'd come back after your year away. Would you believe I still have and use the double duvet you bought me for my birthday to stop Holly complaining all the time? Possibly the best birthday present ever! Most of all, I remember going to visit you in Brussels in 2007 (though it seems like yesterday, it really does), and how much fun we had over those few days. It rained so much, especially when we were walking in the park, but we walked all around the city - I have some great pictures that I will cherish forever. And your flat. I loved your flat. And Mariokart. I think I even managed to beat you once! I learned so much from you and was so lucky to be your friend. You were stubborn as anything, but you had the warmest, softest heart - despite your vicious, wicked sense of humour. You had such an impact on my life it's impossible to sum it up in words. I was looking forward so much to coming to visit you again in the next few weeks. It had been too long since the last time and we were just about to arrange it all. So, goodbye, buddy. You were a truly amazing, wonderful, brilliant person. I miss you so much. You'd probably think too much, actually, but tough. I think there's only one thing left to say: FACE! It was a joy to work with Ryan at Europolitics. He was a real pro: intelligent, energetic, creative and totally reliable! I'll miss him. My deepest condolences to all his family. My grief comes in waves. One moment I'm feeling fine, next I'm nostalgic thinking about past conversations we've had. The last four years I've known you seem short and long at the same time. We used to dream, dream big together. I wanted to go to Europe, you wanted to visit Japan. You'd ask me phrases in Nihonggo from those Haruki Murakami and other Japanese novelists you're fond of reading. I'd ask you to translate phrases in French. I speak Filipino, English and conversational Japanese...you spoke English, French, learning Norwegian, Arabic and Japanese. We studied the same course back in college - Comparative Literature and we somehow moved in the same world - learning languages, discussing literary theories, postgraduate degrees among others. I used to think someday we'll both reach that dream, finish our MA degrees. I really thought that would come to us in a few years. But you left me to continue that. You're gone, gone too fast, gone too soon. Without even giving me the chance to thank you for everything...though I must have told you before how thankful I am for those times you've been there for me, but still...I wish you're still around. I wish you're here to tell me over and over again that I'm stubborn but didn't give up on me anyway. How I'm such a prude but never did you judge me. We had our differences, in our faith, outlooks on life but you never laughed. You had nothing but respect and understanding. I will miss you Ryan and I want to thank you for everything. I will remember and carry those things you've told me...' You're one of the most wonderful people I know and you of all people deserve to have the good things in life. ' I wish you nothing but peace, may you be in peace wherever you are. You're gone too fast, too soon but you will never be forgotten. My condolences to all of you! Well, I knew Ryan since St Saviours when we used to walk home from school together... we lost touch after leaving Carisbrooke and got back in touch a year or so ago on Facebook, and he reminded me of the fact that I once named a rat after him! He was always the one with something to say....and an answer for everything, however strange that answer might be! He will surely be missed. I'll never forget the day i arrived on your doorstep in a hopeless mess with my dissertation. You took me in, sat me down, fed me with brain food, and after a few kind words and some guidance, i was tapping out my dissertation in your lounge. I was a friend in need and you were a friend indeed. For all the good times-our coffee trips and the natters we had, the films and books that kept us inspired, and our mutual desire to travel and learn. I think its coffee on me? My sincerest condolences to Ryan's family, Jeanette, Ami, Dave and Rhys. I'd known Ryan since High School. We had been back in contact on Facebook for about a year. He regularly sent me witty and amusing comments and messages...they always made me smile. Sometimes sarcastic, sardonic, always witty, amusing but above all heartfelt and sweet. I'll always remember when, when we were still at school he randomly turned up at my house one evening. No reason, just because he fancied. Strange evening, but funny. Typical Ryan! i'll miss those stupid conversations on msn - some that made me laugh, some that made me think, and some to freak me out...its weird not having you there. thanks for the times at uni. i would write a meaningful quote from murikami, but i dont know any.